what headlight are you using? pics of wires from the headlight would help so we can see the wiring. 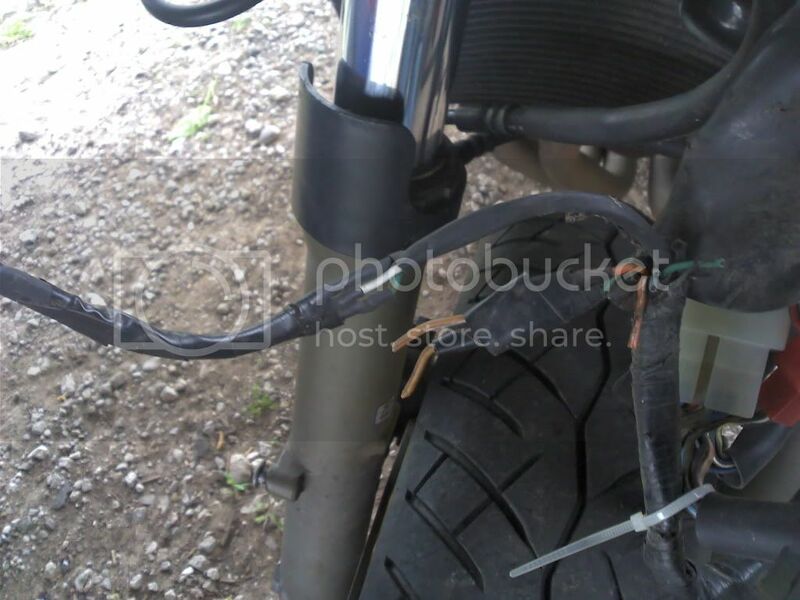 and you should DL the manual or at least a wiring diagram for your bike so you can see what wires are what. after that. if you've a headlight assembly with signals and lights, making a plug would be the best bet. a quick trip to radio shack would do the trick. 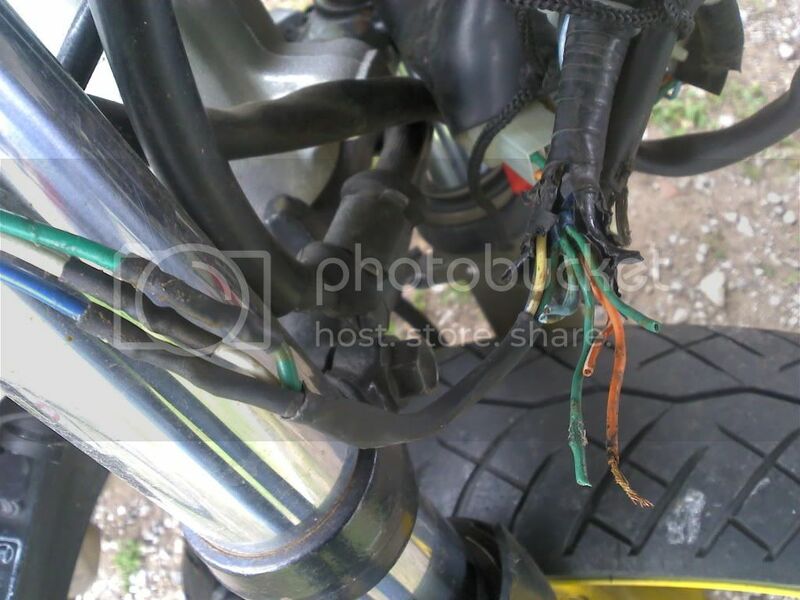 well, there's not really any universal color code.... however, on my bike ... orange wires are turn signals and so are light blue ones. low beam is grey, high beam black with blue stripe, and ground is black with grey dot. look at the wiring diagram, i'm sure it's posted in your section. ok, the green wires are your ground wires. the blue wire (NOT light blue) as well as the white wire are for your headlight (one is hi beam and one is lo beam). double edit - i'm pretty sure they goofed up the headlight too. if you don't see the white wire up front, but you have a blue wire with a whitestripe on it, i'd say thats probably your other headlight wire. so that means a blue wire and a blue with a white stripe wire are your headlight wires (along with the green ground obviously). Last edited by Conrice; 04-15-2011 at 02:50 PM. way better picture, thanks. ALL green wires are your ground, you need them. the three long *** wires are for your headlight. the white one is the lo beam, the blue is the hi beam and the green is ground. each turn signal has 3 wires going to each one in stock form. there's the ground (green for both of them), then there is a solid and a solid with a white stripe for each side. the oranges are your lefts and the light blues are your rights. the wires that are solid are the actual flashing/blinking light (turn signal). the wires with the stripes are your running lights. they are on anytime the ignition is on and they are dim. most people only use the solid orange and solid light blue wires with the green grounds so that they only have a turn signal, and no running light. and so the ones that the previous owner cut are the ones with the white stripes because they are the actual running lights. you don't need them.